It's frequently said that cooking is an art, while baking is a science. To that end, I'm often focused on identifying quantifiable variables—ingredient temperature, pH, protein content, enzymatic activity, chemical leavening, and so on. And yet, even when I've accounted for all of that, the actual work of baking comes down to a physical act, something so subjective I can't pin down the process, only the goal: for instance, to roll cannoli dough to one-sixteenth of an inch. A classic Shaker pin is a single piece of wood, with fixed handles carved out from the barrel. A French pin is carved from a single piece as well, but has gently tapered ends rather than handles. A classic American "roller" is more complex, with a barrel that turns along ball bearings and a steel shaft, allowing it to move independently of the handles; this style can be made from wood, silicone, or even marble. The most important thing to remember about a rolling pin is that it should feel comfortable in your hands and produce good results. When a rolling pin can't fulfill those two basic requirements, everything it touches becomes a chore. If you dread rolling out any dough, whether it's for sugar cookies or pie crust, chances are it has more to do with your equipment than with your skill as a baker. Anyone who's ever seen a dog wearing booties knows that physical discomfort can turn even the most basic actions into a comedy of errors. It's hard to approach a dough with confidence when a pin feels unwieldy, and all the more so if the pin has any sort of technical flaw—cumbersome weight, awkward handles, ball bearings that don't move freely, a warped barrel, or an uncomfortable length. Sound familiar? Stop blaming yourself and consider breaking up with your rolling pin. Growing up, I watched my mom roll out pie dough like a champ, but somehow I always felt like a bull in a china shop with her American-style pin. I avoided making any sort of cutout cookie or pie right up until I went to culinary school, where our student toolkits included a French rolling pin. The moment I picked it up, there was a certain rightness to it, a feeling as wholly subjective as knowing my favorite color—and just as undeniable. Even so, a French pin has some objectively excellent features: At 20 inches from end to end, it's long enough to glide across any dough in one fell swoop, and at just 14 ounces, it's too light to crush even the puffiest yeast-raised biscuit dough. American-style pins of comparable length can weigh four pounds or more, so they can feel like deadweight and be a little tiring to use, or else squish soft doughs into oblivion. A lightweight French pin, on the other hand, feels like an extension of my own arms. 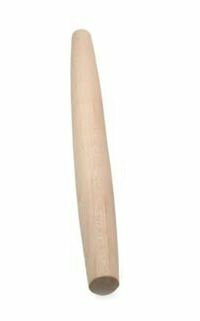 With an American- or Shaker-style pin, my hands are fisted around the handles, focusing my awareness on the pin itself and limiting my points of control. With a French pin, I can place my hands anywhere along its length, allowing for quick adjustments to pressure and movement. As the pin rolls against my open palm, I can feel every bump and irregularity in the dough; for me, it's like the pin disappears and I'm directly manipulating the dough instead. Thanks to its tapered ends, a French pin responds effortlessly to subtle shifts in pressure, allowing for more precise control. For example, if I feel that my right hand is higher than my left, I know immediately that it's because the dough is too thick on the right side. When I apply more pressure with my right hand, the tapered pin will pivot, targeting the problem area to my right without affecting the dough on my left. Since there are no nooks and crannies or moving parts, French pins are also a snap to clean. If the pin is particularly buttery or covered in cocoa powder, I'll wipe it down with a warm soapy rag, but in most instances I don't give it anything more than a quick rinse in warm running water. That simple maintenance routine served me well for 17 years, right up until I left my rolling pin in Tucson. While it sounds like a line from some heartbreaking country song, the reality wasn't so depressing: Like my favorite color, my favorite rolling pin is so basic, it's the same from one incarnation to the next. They say practice makes perfect, so if you've been rolling doughs for a while but still consider it to be one of baking's more obnoxious tasks, it may be worth investigating a new tool for the job. As with choosing a new knife, there's no universal solution that will suit every cook, and that means it's important to explore your options and find what's right for you. I can't say you'll feel just as passionate about a French rolling pin as I do, but if you've never tried one before, it's a good place to start.